Sew Many Ways...: One Year Blogiversary...Give Away!!! "And Sew it Begins" was how I started this blog one year ago today. I never imagined how this blog would change my life...the wonderful people I've met, the inspiration I've found, the kindness of strangers who I now call friends, late nights sewing, up early to get the perfect sun light for a picture, learning to out smart blogger and all it's issues (or maybe they are my issues) and spending more time in Home Depot than in a quilt shop. I want to thank each and every person who has inspired me, made me laugh, made me cry, taught me something new, sympathized with me, left me millions of comments (well, maybe not millions, but a lot!! ), forgave me for my late replies and touched my life more than you'll know. I wish I could give every person, who I have met, some small gift to say thank you, but the next best thing is a give away. 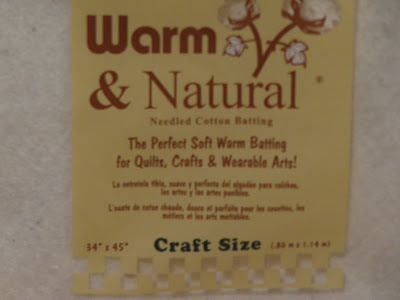 I thought about fabric, but we all have such different taste and favorite colors, so I decide on the one thing that all quilters need...batting. I will pick the winner one week from today...Thursday January 21st. 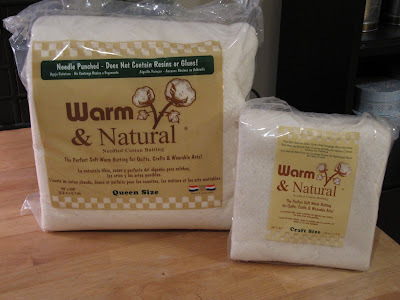 You will receive a queen size (90" x 108") and a craft size (34" x 45") package of Warm and Natural cotton batting. All you need to do is leave a comment on this post telling me how blogging has helped you or how it has changed your life. Good luck and spread the word!! Am I the first?, well blogland has changed my life because I learned about quilting and other crafts thanks to it, I didn't know it was so much fun, one of my friends convinced me to join, I was recalling the month and I'm not sure, I guess was in april 08', I use to come and see what's new almost every day, wow!, it becomes really addicting for good!, I love blogland!, btw, I haven't see that batting before!, looks interesting! Hi Karen, I began blogging not that long ago and initially thought "I'm never going to be able to do this". Well I have and that has shown me that I don't have to be some sort of computer wizz. I have been blessed with the people I have met all on-line and some I have even met in person - how cool is that. recently my husband was sent overseas on a tour of duty for 6 months. We live in a fairly isolated place and don't have neighbours, my neighbours are now my blogging friends, with them I laugh, cry, think and get inspired. Apart from searching for daily e-mails from my man, my next click is on blogspot. Thank you for being one of my neighbours and congratulations on your first birthday. P.S. Love the coaster tut.. got to make some of those.. I started blogging because I was reading blogs and wanted the conection to be two way. I made so many friends through blogging and you are one of them. Thank you so much for your friendship! Happy Blogiversary! Really? Only one year? And you have 367 followers? I'm impressed! But then your blog is so fun and helpful that I'm not surprised! Well, I'm new to Blog World, but it has really opened some doors, I've made great new friends, and am able to step outside my little world so easily! Looking forward to another year of Sew Many Ways! My blog has beginnings, traced back to you! I even posted that on one of my first posts-! I have met such kind, positive people, and learned so many fun ideas all thanks to blogging. I have introduced several projects to my local girls, all that I've been exposed to on the internet. I thank you for the encouragement, and wish double joy for your next year, and those to come! You are such a darling and I'm 'sew' glad we met!!!! Happy Blogoversary Tool Time Girl!! That is not going to be a hard question to answer. Blogging to me has been the support,and the new friendships that the blogging world has given me. Every Pay it Forward every comment every kind wish and ever inspiration has brighten my day over 2009. 2009 was a difficult year for my family but I certainly had a smile each day or laughed out olad when I read some of the blogs (including yours. )I might live one the other side of the world way down in New Zealand but the world seems a smaller place thanks to Blogging. Thank you very much for the chance at your giveaway. I'm going batty over your give away! Love it!! Congratulations on one year of blogging!! Blogging has definitely changed my life!! For instance... I know that every Tuesday I will have a new tool to add to my growing collection!! You can NEVER have too many tools!! Thanks Karen for brightening my day and for being such a great blogging buddy! From one Karen to another, Happy Blogiversary. Blogging really has opened up the rest of the world to me without leaving home. I'm looking forward to meeting some of my blog friends at a Retreat later this year. I really enjoy reading your blog, you are so full of such good ideas. Here's to another year of blogging. Congrats to you on your Blogiversary! I'm personally blogless but I love yours. I really love Tool Time Tuesdays. Your creative ideas with "common" stuff amazes me! The hardware store isn't just for men anymore! Ha! The world has become smaller as I've made friends from all around the globe. It's so fun to find ourselves sharing common creative interests no matter where we come from. I have learned from these talented people and been very touched by their warmth and kindnesses. Life is better for me because of blogging. As you thank us...I want to thank you...why? because for me that is exactly what amaze me everyday I spend blogging...how we give and grow because of each other...people that maybe will never hold our hand has already touch our hearts and made us grow as human beings,women and crafters..
Great giveaway! Happy Blogiversary! I can not say it changed my life but it is interesting to know people all over the world. I started blogging almost a year ago and even as a newbie was welcomed in blogland. I love connecting with others with a passion and getting to meet all the wonderful, caring, funny and clever quilters and writers and mothers and bloggers out there. This is what the "worldwide internet" is all about, the connections between us. Thanks for sharing your life, passion, and tool time branstorms! Happy blogiversary. I started blogging just before you and I can relate to everything you've said. So Ditto! I've actually sewn more and been inspired to challenge myself a bit more too since blogging. It feels like a big friendly quilting bee in blogland. Happy blogiversary to you! When I started blogging I was not sure if I would be abel to do it because I was not very "advanced" in computing-things...but I learnd a lot ( still do) and most of all Writing the post made me see more of the beautiful details in everyday`s live! 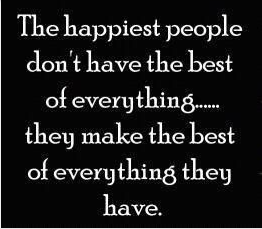 There is ALWAYS something good or beautiful and it is good to focus on this things! Also the inspiration and creativity I find in other blogs helps me develope my sewing/quilting skills. Happy Blogaversary!! wow a year! and I am sure like me you didn't think you had alot to talk about. Blogging to me is a one stop information center of quilters you love to follow up on. You don't have to scan groups or forums to find that quilt you saw you loved so much. I love the process that people go through to make their quilt...thoughts/ideas, recreating a pattern they have received.. I guess to know the "history" of how they decided to make and create the love they have at the moment for that quilt. Congratulations on your first year of blogging! I started blogging about 3 years ago. I had no idea how much fun it would be and how much I would learn from blogging. I have met some wonderful, supportive women through blogging. I love sharing ideas and getting feedback on my projects. I continue to be amazed by women and our collective talents, ideas, support and encouragement! I have only recently found you blog but I'm looking forward to many more years of reading it! There's always a useful tip or two to be found. Congratulations! Happy anniversary! I find so much inspiration from quilting blogs. I could start a new project (or three!) every morning I read blogs. Thank you for inspiring all of us! Keep up the great work...love your TTT! Karen, 1st of all I have become a better quilter and a better stitcher because so many bloggers share their skills. The friends I have made are priceless. Congratulations on the anniversary. What a great job you have done, and what a thoughtful, useful giveaway! I don' have a blog myself, but spend way too much time reading them. For me they are a great source of inspiration and information. I've learned so much from reading blogs! Congrats on one year! You are so right that blogging has changed our lives. It has been a wonderful adventure for me to read your blog and learn all sorts of new things. I am looking forward to more inspirational posts. Please don't include me in the draw, I have all the batting I need being a long arm quilter! Yea and Anniversary! I started blogging one year ago this month too, and I've learned so many new things! Along with the perk of all the new friends you gain, with all the picture taking I've learned to look at the world in a different way. Thanks for the give-away on your special day! I started a blog last year but it has gone by the wayside. Took too much time away from my quilitng. As for reading the blogs of others, I have learned so much in this past year. I am amazed every day at the kind and generous nature of bloggers. Happy Blogiversary, I'm just starting in the world of blogland and I'm learning alot and getting alot of tips from the many quilters. As you know I just had my 1 year blogaversary. I have enjoyed all the blogs I have visited and after my SIL's accident I really found out what a caring group of people bloggers are. I have also made many friends over this last year and charish them dearly. My daughter Terry started my blog after a friend Sandy suggested we both start one. I really love seeing what everyone is doing. Congrats on your blogaversary too. I love blogging as it gives me a place for writing about things I enjoy and it's great to have people reading it. Reading and writing blogs have given me many new friends and so much inspiration. Congrats on a year of blogging. Blogging has gotten me friends from all around the world. I had no idea when I started. I also learned a lot and have had many quilting problems solved by asking questions on my blog. I have been at it for nearly five years and have no intention of quitting yet. Happy blogiversary. I think having a blog keeps me motivated to finish what I start. It's nice to get feedback from other quilters. It's also really fun to make new quilty friends! What a wonderful giveaway! Blogging has changed me in that it gives me motivation to try to do my best and quit being so impatient. It has helped me improve my photography skills and writing. The best thing about blogging is the relationships with people that you'd never know otherwise. I haven't been blogging that long, but I try to keep up. It is such a nice way to keep track of all the wonderful projects that others are doing. And I really appreciate all the free tutorials out there. Congrats on your successful venture. I have just loved meeting people from all over the world. I don't get to travel much but I feel like I am visiting everyone in their home, sitting down for a cup of tea, picking up a needle of thread and having a little chit chat about their day. It's also help me in a very off-hand way, too. I couldn't understand why my son was on World of Warcraft so much. I would get angry at him for wasting his time spending lots of time on the computer with people he had never met from all over the world. Wait???!!! Wasn't that what I was doing? Blogging has certainly made me more tolerant and understanding that my point of view isn't the only one. Muchas felicidades desde España !!! Espero que este sea el primero de muchos años blogueros. Congratulations on one year of blogging!! Karen, your blog is what got me interested in bloging..I never thought I would be able to do it but last November I started and although it is coming along slow..it is so much fun. I always check your blog first to see what new ideas you have..You have taught me so much. Congrats on one year of blogging!! I always love to check blog to see new ideas and quilts and also to taught about tips.But the best is the relationships with other bloggers that you never know but love the samethings. I fell in love with blogging I don't know how long ago. I am guessing ecasue I always loved biography and auto biography books in school. Now it's a way for me to journal my daily activities for my 3 grand children. I've made so many friends both in the sewing world, cooking world and just plain old friendships that are bloggers who arent' sewers or cookers'. blogging changed my Life?? Started blogging after my granddaughter survived drowning in a pool. It was a release. Now it's a way for the extended family and friends to see what is going on in our family. I've always enjoyed writing and this is a great outlet. Not to mention I love reading about other people's lives. Bloggers are great! Readers learn, share, drool, laugh and cry with bloggers. I finally had time to compute to my hearts content, discovered quilting blogs, and started planning/yearning. Read as many blogs as I could find, adding the best to Bloglines (yours was one of the first!). My first real quilt was a queen, and my second a king! Can we say overachiever? But I am addicted! My next one is a king on a treadle! Thank you for being there and sharing and teaching!!!! What a wonderful giveaway! thank you for the chance! Blogging has changed my life in the fact that my sewing/quilting "to do" list is never-ending! LOL. All the wonderful inspiration out there. I wish I had all the time in the world to get it all done. I have learned so many things through blog readying and browsing. I've made new friends through my new blog in the past few months. It's a great, giving community. Congrats on one year! Blogging has linked me to friends. That is the richest thing it has brought to my life. I have made friends from all over the world. People I would NEVER have met. Blogging has inspired me. Everything from quiltmaking to trying new techniques, photography, trying new fabrics (I'm now branching into sewing clothes) all because of blogging. I have learned so many wonderful tips and tricks that I didn't know before. Well I could go on all day but this will end up being a blog post and not a comment ;0) Blogging has really enriched me in many many ways! Congrats on your blogiversary! It is a wonderful world out here in cyberland - so many people to meet and so much to learn. I have learned over the last year how incredibly generous and loving quilt bloggers can be. When I organized Terry's quilt, the love that came into my computer and my home just blew me away. Bloggers donated not only squares for the quilt, but services and money and advice. I've met so many new and wonderful friends through that project! It's so fun to see the familiar names and remember the lovely blocks they sent in. And even bloggers were generous enough to send ME fabric and goodies to help cheer me on through the work (I'm actually just sewing the binding on the big quilt now!) I have also learned new techniques and free motion quilting online. I've gotten so much encouragement through my blog as well to try new and different things. Overall, this blog land has been a blessing for me. I know it has been for you too! Congratulations Karen and I hope this new year brings both of us more new friends, more comfort and more experiences to enlighten our lives. Happy day to you! Do I always comment? No, not too much. Do I always stop by? Yes - can't miss a fun, neat, cool new tool. Congratulations Karen! Having my own website has helped me become much more productive in my crafting. The greatest benefit to it though would have to be all the wonderful people I have met since I started and all the fabulous ideas that are shared every day. Reading yours has made my trips to Home Depot all the more interesting! Congratulations Karen, on your one year blogiversary! Blogging has been a wonderful experience. Meeting new friends from around the world and learning all kinds of new and creative things. So many bloggers are so kind and generous. And you are certainly one of them :-) Thanks for such a great giveaway. The batting is certainly something that we can all use and enjoy. although i don't have a blog i do have a long list of ones i like to follow! when i'm feeling down or in need of inspiration there you all are!! and when i'm just too busy to visit, you never mind - perfect! Happy blogaversary! I know what you mean. I think we can all relate to what you write here today. The inspiration we have received, the friendships we have made and the joy we have had is something one would never imagine when one starts a blog. It truly amazes me each and every day. Happy Blogiversary! I began my blog as a way to keep the family informed of Larry's condition without making too many phone calls after a long day at the hospital. It has become so much more. An opening to the lives of people all over the world. I laugh, and cry with them, and worry about them if they don't blog for a while. I am inspired by their creativity and the fact that they accomplish crafty things! It never fails to lift my spirits! If I never win another giveaway I am a winner, just from the exposure to all these wonderful people. I would love to be included in your give away. You have shown all of us how many tools we have around the house - in our husbands workshop - at the local hardware store - that we can use for quilting, and most of the time at a much lower price than purchased in a specialty store. thanks for all the inspiration. I am blogging for a year and a half and about 210 blogs further on the road then I was when I started. I confess that I am kind of addicted to reading blogs... I have had so much inspiration starting new quilts, sewing more on the ones I was busy with. I sew more then I did, just because of the daily inspiration. Sometimes I have to force myself though to quilt reading blogs and actually start sewing. I love your TTT to bits, do not use them all but you get my brain going! Thank you so much, and please keep blogging! Congratulations Karen on your anniversary and great give-away! I am a reader of blogs, not an actual blogger. Even so, blogging has enriched my life more than I can express. I do not belong to a quilt guild and none of my friends are quilters, so this outlet has been a lifesaver for me. I have learned so much, have tried new techniques and have been inspired (and entertained) by your blog and the responses of your readers. Thanks for a great question! Hi, I haven't had the nerve to post anything on my blog yet, but the inspiration I have received from all my favorite bloggers has been imeasurable. It has opened my world up to ideas and projects that I would not have known about otherwise. Happy Blogiversary, Karen. Although I don't have a personal blog, I have gotten so much inspiration following several blogs such as yours. I have discovered many new tools, patterns, techniques, and fabrics by reading different blogs. Congratulations on your one year blogiversary Karen. Blogging has given me so much inspirations and support in my quilting, I can not imagine what life would be like without it! Thanks for your part in that! Happy 1 year blogiversary! I know what you mean. I can relate to what you wrote here today. The inspiration I have received, the joy in friendships made allover the world is something I would have never imagined when I started my blog. It truly blesses me each and every day!! Makes the world smaller and so much more special. Look forward to more years of Tool Time and whatever else you decide to share with us! Happy 1st year Blog-o-versary! Blogging has changed my life, not only by introducing me to lots of talented quilters, but by giving me inspiration every day. My blogging friend Jen is one of my closest friends and even though we are thousands of miles apart, she is such an incredible friend and I am so glad I met her. Reading blogs has given me so much inspiration and ideas for sewing as well as knitting projects. I'm even tempted to pick up crochet. It has renewed my love of crafting - thank you! Batting for a giveaway is as smart as giving diapers at a shower! You can't beat it!!!! Every quilter needs it and this is the best! I've only been blogging for about 6 months or so, but it has changed my world immensely. I live, literally, out in the sticks and I'm so far from other quilters, quilt shops (1 hour away) and any sort of encouragement and inspiration and the window that is the blogger world (specifically quilt bloggers) has filled that hole for me! It gives me inspiration for products to put in my shop and for gifts for people in my life. It's also a way for me to have a "social" life, if only thru a wire! YOU have impacted it because you are one of my favorites! Thanks so much, and I wish you many more posts in your future!!! I discovered blogging just over a year ago and I have learned so much! I was primarily sewing clothes from my granddaughters & when I saw all the beautiful modern quilts out there, I realized I had found a way to use all the leftover fabrics I have accumulated-and it's a lot! Love your tooltime Tuesdays & would love some batting! Thank you & congrats! I've also made some great friends and learned a lot in a very short time about quilting! I blog every day I am by a computer. I may not be posting, but I am reading others blogs. I have learned so much from other quilters. There is a world of knowledge out there. You can't get this anywhere else. Since I am a newbie to quilting, I have learn a lot from the tutorials that are posted, not to mention the friendship that I have gained. They ar priceless to me and for that I am forever thankful! Thanks for this opportunity to share about the blogging world, I too have just a little over a year under my belt (doesn't it feel like it's been forever?) and have no idea how I could live without all the wonderful moments and friendships I have gained. It has opened me up to extending myself and for that I gained huge gifts in reward. I can see that you also share this feeling as it comes out in all your posts, thanks for sharing. I wrote to you recently thanking you for helping me think outside the box and had to laugh when I woke up yesterday thinking of being in a hardware store looking for galvanized pipe to hang a quilt on for my nephew. Well, you told me to think 'hardware' and what is better for a 20 something kid and his new condo? HARDWARE!! lol Thanks. My daughter moved to the other coast, sigh, and blogging was a way for us to visually keep in touch. I've been blogging for almost 3 years, now. In addition to the family/quilt, etc., blog, I have one for photos, one for books and one for recipes. As you can see I like blogging. When I started quilting in June, quilting blogs became one of my best learning tool. Yeah, for blogs. I've made so many friends and learned so much from reading others blogs. I love it! Hi Karen, and thank you for this wonderful opportunity. Hey, Happy Blogoversary too! As I live quite remote and am retired, I keep in touch with my world of friends (& family) via blogging. This is where I find my inspiration, application (esp. TTT), daily giggles and so much more. Looking forward to another glorious year! Hi Karen, I have been a long time lurker, erm - I mean, fan of your blog for some time. I have just recently started my own quilting blog - b/c after reading others peeps blogs, drawing instruction, information and, OF COURSE, inspiration from all that I read..... I needed to give it all a whirl myself. 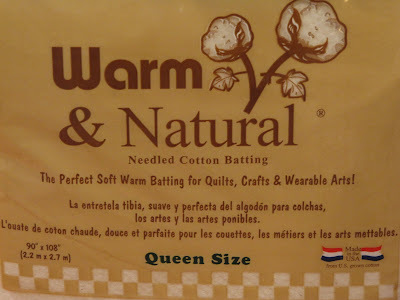 I LOVE Warm & Natural batting and use it in all my quilts. So I hope that I'm picked as a winner! Thank you for all the wonderful ideas you provide in your blog! Although I don't post as much as I could, I have enjoyed using my blog as a way of keeping an online journal and keeping in touch with faraway friends. Wow - only one year? I mean, congratulations, but I would have thought you'd been here longer. You're a natural! Blogging (and the blogging world in general) has changed my life in a number of ways, not least the wonderful people I've met. I can't believe how much friendship and inspiration is to be found in blogland! Congrats!!! Keep up your great blog! I am not a consistant blogger but I do enjoy posting my quilting pics and reading blogs of very creative people! Thanks for the chance on the give-away! Congratulations on your milestone. I don't have a personal blog, but contribute to group blogs with people working on similar projects. I love the connections with people all over the globe that have really expanded my quilting horizons. I've been so inspired by reading and viewing others blogs on their quilting journeys. Congratulations, Karen! I just had my first blogiversay last week and had a giveaway. It was so much fun. I have made so many new friends since I started the blog. It's like being part of a network. I can see the next year being even better. I've been blogging for just over 3 years on my personal blog (Books Lists Life) and I think it's really made me more aware of how I am as a person and a mother. Sounds silly, but if I can blog about my kids watching Spongebob or about my kids making something, I'm gonna choose the making something, so it forces me to be more creative. My sewing blog (made by lisah)(both on my profile) gets much more sporatic posts, but I'd love to plump it up this year. Blogging has given me the courage to give up my "day job" and have a go at turning my craft into my business. Let's see how it goes. I'm currently in Month 1. I just found out what blogging was this past Spring! Didn't even know it existed! Where have I been you ask? I think hiding somewhere. I've learned how to put zippers in small bags, made beautiful tote bags from free tutorials, learned how to put in a wonderful garden, make delicious bread and the list goes one! All from wonderful people around the world! I have -Yet- to start my own blog. But I am feeling inspired by all of the wonderful bloggers I follow. Those blogs have given me great confidence to push myself forward and continue to learn and do more than I thought I would ever do!!! Congratulations!! The best thing about blogging for me is the wonderful people I've met. I have met so many wonderful friends on blogs and talk to them through email now. Also the exchange and learning has helped me a lot in learning to quilt better and inspired me to try new things. Blogging has brought me so many friends from around the world. I get comfort, encouragement and so so much inspiration!!! I've learned so much from all the craft & cooking blogs I follow! Whenever people are amazed by something I've done, I just tell them how easy it was & send them the link to the fabulous blog. CONGRATULATIONS ON YOUR BLOGIVERSARY! I too feel so fortunate to have met such nice people - have gotten some really good ideas for quilting and sewing and the inspiration to do more, like making some penny rugs! The best thing I've learned how to do, is my own stipling or meandering for quilts and table runners by practicing on hot pads. There is so much knowledge out here in blogworld!!!!! I can't even begin to tell you how blogging has changed my world!!! It has opened up a whole different way to socialize and communicate with others. You can ask questions and get so many opinions and answers. You can learn anything you want, you can tap other's experience, pick up new ways to do things .......... it's just endless. For me, being from a small town and very few quilters ...... I now have many people that I can quilt with!!! I just love bloggers!!! I've been blogging for over 2 years now and I am amazed at how many wonderful people I have had contact with. I have learned so much and gotten so many neat patterns from other bloggers. I would love to win the batting! I am pretty new to the blogging thing, but, so far, I love it. I have met so many quilters and so many amazing people, I can't wait to get on line to check out what they are up to. I get great ideas and new pattern ideas for quilts, just wish I had the time to make them all. Congrats on your One Year blogging and I look forward to following you in 2010. Once I got my feet wet, I knew that I wanted a blog but it took me about 6 months to actually get involved. Now that I have, I am loving it! I have learned about great ideas, techniques, patterns from around the world because of blogging! I have blogging friends from the UK, Australia, Sweden to name just a few places--ones that I would never know without quilt blogging! Blogging has given me opportunities I never knew about and I love it! Thanks so much for yet another chance to benefit from blogging with wonderful quilters! I have only been blogging since June and I cannot begin to express how much inspiration, kindness and love has reached my PC for all across blogland! It's just amazing how much support and encouragement you all offer, thank you! WOW, 98 comments before me. Well, I just dropped in to say that blogging has been great for me. I have been able to share my creations as well as some of my family. And I have a few followers that I hear from often enough to begin to see them as internet friends. I have learned from other's blogs and have been inspired from almost all at one time or another. And most recently, I learned about an online class I would never have known about and am broadening my quilting horizions. I thoroughly enjoy reading quilting blogs as I get so many ideas from other quilters this way. Keep up the good work! Happy Blogiversary! And thanks for the give away! I only just started blogging and I did it to try and connect with talented quilters and needleworkers. I have met a lot of amazing people who are always willing to offer a word of support and to share their knowledge and experience. I am blessed to have met such a wonderful group of people! The tutorials! The visual of having a step by step picture and instruction by precious bloggers who have taken the time to post tutorials have made ALL the difference! They give confidence and more information/tips than anything I've read in a pattern or book! Thanks for this great giveaway! Blogging helped me get back into sewing. Reading about what everyone else was doing ..was very inspiring for me. All the creative people and ideas that I see everyday ...flipped my switch to the on position and I'm loving it! I started my blog a little over a year ago. I've made some great friends that I met through blogging. I joined Kelly's Charming Girls Quilt Club, it's a great way to give incentive to get quilt projects done. I've become addicted to Schnibbles quilts since joining A Year of Schnibbles. I've always loved the little Schnibbles quilts but I've made more of them since this club started. I've won some great gifts on blogs. I won one from you, some 5" Thimbleberries squares that I still need to sew together. I've also discovered a way to waste several hours in the evening my surfing the blogs. Congratulations to you on your one year blogaversary. I enjoy your Tool Time Tuesdays. Congratulations with your blog anniversery! Great that you do this give away. I am blogging almost a year now and love to get so easily in touch with other quilters all over the world (i live in the Netherlands) I am hooked on it, try to follow other blogs almost every day! Heh! It's that Tool Time that got me going here! I started about 2 years ago when I was learning to quilt...I made so many mistakes...still do...and thought I'd share with family and friends...I had no idea that there would be a whole new set of friends out there to share the joys and experiences of everyday life in the world of quilting blogs. I have my coffee in the morning and read blogs...always this one for Tuesday funnies! I only use warm and natural, it's so easy to work with. Congrats on reaching one year. So fun! It is a little funny to think about how blogging has changed me life. But in some ways it really has. Like the quilting side of my life. I love all the ideas and inspiration that I find on people's blogs, especially when they include free tutorials (because I hate buying patterns). Wow, there is nothing like a give away to get us commenting, is there? I just want to say that I have been blogging for 9 months and found your blog early on. Since my blog focuses on being a resource center to find the great things generous bloggers like you provide, I have found myself back here often to share a link to you. Your blog in particular has changed the way I look at trips to the hardware store with my husband. It used to be boring! Karen, you have given me new vision and a fresh perspective on that time with him. Also, I love the way we get to know people of other places that we would never had had the chance to know and how they are different but almost always similar to us. A world vision is a great thing. Thank you Karen for this giveway but most of all for your generous and loving spirit to share. Blogging has changed my life is SO many ways. I have made new friends and even met some in real life - some of which have turned into true real-life friendships. I also get so inspired looking at others creations. I have loved your Home Depot inspired posts!!! I look forward to seeing what new creative ways you find to use plumbing and electrical gadgets this year!! Happy 10 year Anniversary! Today is my 10 year wedding anniversary. I am lucky enough to be married to a man who supports my crafting & creating addiction. I'm recently new to quilting, and have learned so much from reading blogs! I love to read also, so I get the best of both worlds. I live in a fairly rural area, so neighbors are few and far between, and have been out of work for over a year due to a health problem, so blogging keeps me in touch with people who share my values and interests. It has been a great addition to my life, and picks me up when I'm feeling low. I'm a beginning Quilter and I just found you! Thanks for sharing! I Love your blog too! I have learned sew much from other quilting blogs. I am sew inspired and less perfectionist!! Congratulations on your blogiversary Karen! I enjoy reading about your creative ideas. Blogging has enriched my life by making new quilty friends, challenged me to learn about new techniques, and inspired me to finish projects...so I can post them of course! Can't imagine a day without connecting to the online quilt community. I started blogging because I've always enjoyed writing -- but didn't want to do it to earn money! I was afraid that would take the joy out of it. Same thing with quilting, by the way. Readers tell me that they like my writing, that I make them think -- it feels good to me to read those comments. I've grown as a thinker and as a quilter through the other people I've "met" through blogging. I've learned practical things from your blog, about Japanese culture from Tanya's blog, and developed a real affinity for Australia through reading the Aussie blogs. And I've learned, or relearned, that there are nice people everywhere! Congratulations on your blogaversary, Karen! So far I have learned a lot about blogging in general (with a little help from nice bloggers like yourself). My biggest surprise was probably that starting a blog is nothing like being the new kid at school; there are so many wonderful people out there who welcome you into their world and wish to be a part of yours. I enjoy learing about other cultures; how different we are and still the same. I also have to refresh my time management skills; it's so easy to get lost in the blogosphere. I love your blog, just found it recently and really liked your new sewing room. I don't have a blog, however my daughter has two. I look forward to Tuesday because I can't wait to see your new Tool Time. PS. Don't enter me in the giveaway. I just enjoy your blog. Blogging gives me ideas and helps me connect. I live in an area with no fabric stores and no quilters' guilds, so the Internet allows me to see fabric and realize that I'm not weird. Lots of other people like to look at material and quilt too! I hope to start a blog myself when I get a bit braver. What a great prize for someone- batting is one of the most expensive parts of quilting and something that you always need. Congratulations on your blog anniversary- it is so much to communicate with other quilters from around the globe. who rekindle the inner spirit'. Happy bloganiversary! I have to tell you that the first time I came overe here I was impressive because I saw the place were you sew... simply wonderful! Having a blog gives you the oportunity to know lots of people everywhere and the amazing things people do. Hello,Congratulations on such a lovely blog.Blogging has made me more confident in my sewing. Meeting wonderful people on line and in person. Most of all finding inspiration is out there all around us. Happy days. I am new to blogging. I enjoy reading your blog and all the great ideas. I have so many projects added to my "to do list" that it is now a two page list. I love your Tool Time Tuesday because your ideas are at the same "wave length" as my brain waves. My handy dandy hardware man knows me well and assists me in my many project ideas. Keep up the good work, it is enjoyed by so many people. 1 year - wow - congratulations! I've enjoyed getting to know you over the last year and hope that you'll be blogging for a long time yet. I've been blogging almost 4 years and love it. I've been inspired, encouraged, enabled and taught by so many about so many things. It's been a wonderful journey and one that I've enjoyed immensely. I am almost to my one year of blogging, too! It is such an inspiration to see everyones creativity, and it's a great motivation to finish things so we can "show-off" a little! Wow - I can't believe you are having a giveaway. You already give away every week with all your tips and inspiration. Blogging has helped me meet fellow quilters from around the world and has given me a real sense of community. It also motivates me to be productive, so I have something to show on my blog. Congratulations, I check TTT faithfully! While starting a blog is still on my to-do list, I have gotten so much inspiration from all of you generous and creative bloggers out there! Oh, and that batting you're giving away is my all-time favorite! even though I don't have a blog. Happy Blog Anniversary to you, Karen! Blogging certainly changed my life in a major way! Who could possibly have known? It led to several more blogs, writing a column for a monthly magazine,birthed a ministry,and developed five books in progress - just to name a few of the ways. (I just discovered your blog recently, and it is absolutely one of my favourite reads!) Again, congrats to you! Happy Blogiversary to you! I follow you in my Google Reader and quite enjoy not only the purely patch/quilting stuff but your TTTs - lovely ideas to help us be more organised and more productive as a result. Thank you for that! I am quite new to blogging and to be honest do more blog reading than publishing. I think that is normal since I am relatively new to quilting as well, so I am trying to soak all the wisdom out there in Blogland and I like it. Happy anniversary --- I've been blogging for almost four years now, just a private little log of my crafts and life changes. Along the way, I've made friends, been challenged to grow and have learned so much about myself and this crazy world!! I have learned so much thru reading these blogs. Everyone has been so helpful and kind in sharing their ideas, patterns, tutorials, etc. I find myself anticipating the next blog of yours. Thank you so much for sharing all your ideas, etc. I have learned so many wonderful things by reading your blog. I just love your blog ... you teach me to think outside the box! Thank you and congratulations on this anniversary. I just found your blog, I just starting blogging about 2 months ago, your right it can change your life. You get to meet and read about some pretty intersting people, and where else can you connect with so many that share the same love of creating as we do. Congratulations on your 1 year anniversary. Happy Blogiversary! I love blogging! I do think it one of th e most addicting thing ever. But it has changed my life in several way....I have made some really fun friends....it has broaden my horizons....and made me relize every monent can be photographed!! Wow 1 year - Congrats! Blogging has helped me to reignite my imagination. I have found some wonderful inspiration through various blogs. Also now that I have my own blog I find I want to get those projects done sooner so I can blog about them. Congrats on one year! You've amassed quite a following in that time! :-) Blogging has changed my life in a few ways - I've become more productive with my sewing, I've learned a LOT of tips and tricks, and (most importantly!) I've made new friends, both local and virtual. I love it! Happy Blogiversary! I had no idea how blogging would change my life, I've met so many wonderful quilting friends around the world. I feel a close connection to all of them, it's so much fun I never want to stop. Well blogging has changed my world a lot. I have made friends with people all over the world. I have learned all sorts of new things. P.S. I would split that prize between two winners....as its such a generous giveaway. I love to read blogs for inspiration and keeping in touch with the quilting world! We moved several years ago and left my quilting friends, so I feel like I have friends that I have never met when I read blogs. Would love to find some quilt friends in my area. You have a beautiful blog. Thanks for sharing all of your great ideas and projects! Thanks for the giveaway. I can ALWAYS use batting. Great idea! Blogging just makes me happy! It also reminds me to journal about all my quilts. I have gotten so many great ideas from reading others blogs...yours is always inspiring! I haven't been blogging for a long, long time - just a few months. But I've already met some of the most wonderful people - I just love it! And your blog always has the best ideas for organization and fun projects! First of all, thank you for all of your ideas and TTTs! My first year is almost here for blogging also. It has changed me because I am so committed now to finishing, starting, or just working with my favorite thing...FABRIC! Here's to another year of fun for both of us! I don't blog for a variety of reasons; one of which is I spend way too much time reading other people's blogs (at work!). I love reading certain blogs, one of which is yours (esp on Tuesday) and have learned so much from my reading. I have learned so much about quilting, savings, organization with blogging and mostly reading blogs - it's unreal! who would ever have thought that reading other people's thoughts, likes, dislikes, and creaft and savings ideas, that you can learn so much! I have so much fun visiting my favorite blogs! Congrats on your first year anniversary. I found your blog about 3 months ago and enjoy reading it. I especially like "Tool Time Tuesday". You have given me lots of great ideas. I have also enjoy your blog links. Thanks for hooking me up with other blogs. Continue doing what you're doing. I like it! Karen - Congrads on your blogiversary! I just found your blog and am so thankful for all your wonderful tips! I started my Blog to share photos and stories for our family far away. Then I started searching, reading, finding some GREAT Blogs to enjoy day after day, from people all over the world. And yours is one of the many I enjoy dropping in on. Blogging has changed my life in meeting so many friends all over the world. It has brought the quilting community a wee bit closer together for sure. I love being able to see show and share on a daily basis too. I'm not so isolated and home alone with the quilt blogs at my fingertips. I have learned so much from blogging and have "met" so many wonderful quilters. Thanks for the chance! Blogging has encouraged me to try things I hadn't thought off, and to see the world in ways that I normally wouldn't have. Greater exposeure is a wonderful thng! I love blogging. It gives me an outlet to show off my finished projects. I usually spend Friday mornings traveling through blogland, picking up ideas for quilts and other things. Congradulations and continued success! The most important way that blogging has changed my life is that is has legitimized my love for crafts. I always thought that I was alone in my want to make things (despite the craft and fabric shops). I am inspired by blogs like yours. They really have helped me find my way in craft and life. It's seems silly to say, but I feel like I have so many friends even on my loneliest day! Blogging has been a great way to meet people from all over. I've even discovered that my 20 year has been stalking my blog! Love your Tool Time Tuesdays! Thanks for the chance to win. Blogging has opened the world to many of us who live in out of the way rural areas. I've found old friends and classmates. Family members around the world can keep up with us and us them too. I've learned so much about quilting and especially about longarming too. I could go on and on. Please throw me into the pot. thanks. I have had encouragement to try many new things. I am currently working on an English Paper Piecing project....I wouldn't have tried it unless I saw someone else's project on their blog. Congrats on your year anniversary! I love blogging so much. I can say that it has truly made me a better quilter. I learn so much from all the blogs out there that are written by such knowledgeable people - like you! But on a personal note, blogging has changed my life recently because I have gotten very involved in making charity quilts. I wouldn't have been able to find out about all the opportunities (or generous quilters) without blogging and Yahoo groups. Making charity quilts and knowing that I'll be brightening up someone's day is a great feeling! Congratulations on your anniversary. What a fun blog you have with many delightful insights! BLogging is a way of gathering information and inspiration. I do not have my own blog at this time, maybe in 2011, but I am learning all the time. Inspiration, learning, excitement, ideas, sharing, smiles, sometimes tears, but a wonderful Internet tool. I LOVE BLOGS. Blogging has changed my life in so many ways. The most amazing thing I have discovered is how similar we all seem to be, no matter what part of the world we come from! I love all the words of encouragement and the positive attitudes out there too. Thanks. The inspiration is incredible! The friendships made are awesome! I am very new to blogging in terms of leaving comments. It's been about a year and I spend hours lurking on the blogging sites but do not post. Late last year I joined a forum and have discovered the wealth of information and knowledge that everyone is willing to share. Reading blogs is a wonderful way to connect with others who share similar interests and be inspired by them. Do so appreciate all the frugal tips you share on your blog. Congratulations on your blogaversary. Wishing you many more! Happy 1st Anniversary!!! Blogging has become a lifeline to me...reaching out to new friends all over the world! I've made friends who have brought their families to visit us and spend the night on their way through to another destination. We've loved having them! And now consider them dear like-minded family friends, and their photo adorns our fridge. And my quilting buddies have been great with tips, tutorials, and free giveaways!! Thanks for yours! Happy Blogaversary. I love reading the blogs. I find lots of creative ideas for quilting, recipeas I want to try, etc. I am enjoying your tool time tuesdays. I have haunted hardware stores for years as well as sporting goods and auto supply stores. It's amazing what you can find there. Blogging helped me because just about everything I've learned and every idea I get comes from blogs! My maternal grandmother, my only quilting relative, died long before I was born, so I feel like I'm borrowing other people's grandmothers by reading all you lovely ladies' blogs online! Happy Anniversary from northeast Texas! Don't we live in amazing times?! Through blogs I have 'met' so many wonderful people. Learned so many new techniques. And have way too long of a want-to-do list. Your blog is contributing to said list. I don't know whether to thank you or not. Happy Anniversary! A year in blogland goes by very fast, doesn't it? I started my blog as a way to advertise my online fabric shop and let people get to know a little bit about me. It's become much more than that, though, and that surprised me. I have made many good friends along the way and have even met a couple of them in "real life." It's such a strange concept to me and yet it works so well!! I have met some great quilters through blogging who I now call friends! How neat to "meet" people from all over and connect! Thanks for the chance to win! Happy Anniversary from western West Virginia! I have recently became an avid follower of quite a few blogs...this is my way of connecting with other quilters! I have found so many creative projects amongst them, but am especially fond of the sharing and caring shown by both the bloggers and the readers. I am thankful for being allowed into your home and heart for a few minutes each day! Oh Karen, I have just found your blog site. And I am in love with it. You have so many wonderful and usefull ideas. Blogging have change my life a little last year. I have only been blogging a short time, and it has been a hard year for me and well, just being able to write a little about it has helped. (Lost my mother last year..). But finding online friends that share the same likes, and ideas that you do are to me a gift. Congrats on your 1 year Blogiversary. Congrats on your 100th post. Count me in. Congratulations on your 100th post. Quilt blogging as reinstated my interest in quilting and fabric hoarding. My google reader is bogged down in quilting blogs. Congrats!! I love blogging because of all the inspirations I get. It is amazing to seeing everyone's quilts from start to finish. It has inspired me to branch out and try some new techniques. I can spend hours looking at great ideas and getting so much creativity. But I can spend all my free time on here doing that, and take away from my quilting and crocheting time. And I am not going to stop!!! Thanks for the giveaway! Congrats to whoever wins! Congratulations on your first year! I love the way you combine my favorite things, sewing and making really cool stuff from the unexpected! I love Tool Time Tuesdays! I just LUV this Batting. Its almost ALL I'll use (unless something else is on sale, lol)! And queen is the size I buy most often too! Thank you for having this give-away, hope I win! Well this is an amazing medium the world of blogging. I find that I know so many more people now than I did almost two years ago. Oh Tool Time is one of the best things about Tuesdays! I love this batting. I use this all the time. Congratulations on one year in blogging. Hope I can enter your giveaway. I am working on my first quilt. Hope I can get as talented as many of the quilt bloggers. Happy Anniversary! I love tuning in on Tuesdays to see what new idea you have for us. Even though I do not have a blog myself, blogging has allowed me to "meet" so many wonderful people from so many places and be inspired by all the great ideas they share. It beats all the junk on TV by a long shot. Thanks for being so generous with your time and ideas. I'm looking forward to what the next year brings. blogging has opened so many doors for me as well. So many new ideas, thought processes and Just a way to "journalize my crafts"
Another wonderful part of blogging for me as it has been an addition to my new "phase in life" when I am just about to enter Empty Nesting. Its kind of quiet around here.